Ever wanted to make books a part of your everyday attire? Check out this fun article by Derek Attig! It’s been quite a few weeks for little books. First, a collection of thousands of wee readable books got a writeup in the New York Times. And then, more recently, a team at Simon Fraser University entered a creation into the Guinness Book of World Records: the world’s smallest reproduction of a book. 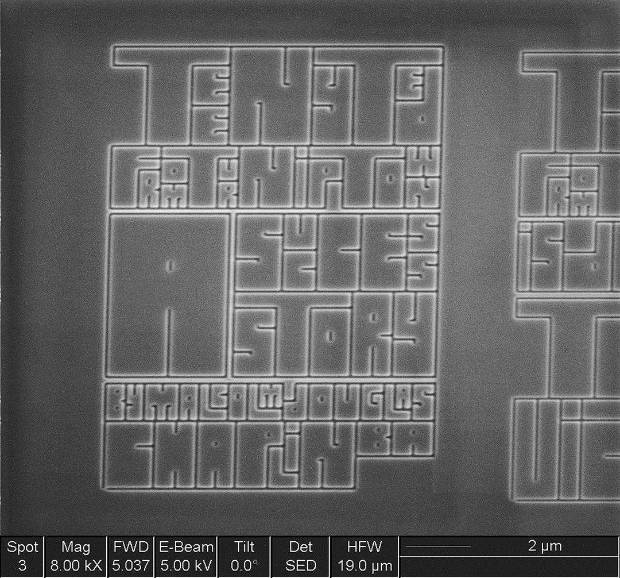 Teeny Ted from Turnip Town (ISBN-978-1-894897-17-4—yes, really) measures 0.7×0.10 millimeters and is printed on silicon. Oh, and you need an electron microscope to read it. Talk about an e-reader. Image from a handout by SFU Public Affairs, reproduced by the Vancouver Sun. This is undeniably cool, of course. But there are no pages (the whole thing is printed on a single sheet of silicon), and it’s way too small to handle, so you certainly miss out on some of the tactile pleasures of a tiny book. “Little Library” (2009), by Todd Pattison. Photo from the Guild of Book Workers. It’s a book. Filled with books. Beyond the unsettling, entrancing charms of infinite regress (Oh god, what if you opened one of the little books and it, too, was filled with books? ), this piece is just plain lovely. The variety of books and bindings in the 1-1.5″ book signals the thought and care that went into making this wee little library. 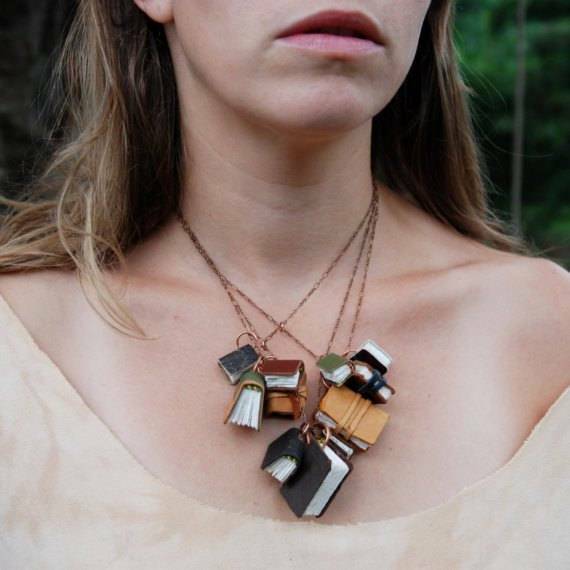 Autumnal Library Book Necklace, from Peg and Awl. I’ve seen this one in real life, and it’s even more gorgeous that it looks here. The little books hang like leaves on a branch, held in place by delicate, crisscrossing chains. The pages don’t have words on them, alas, but they bring to mind the wild piles of books the wearer probably has at home. 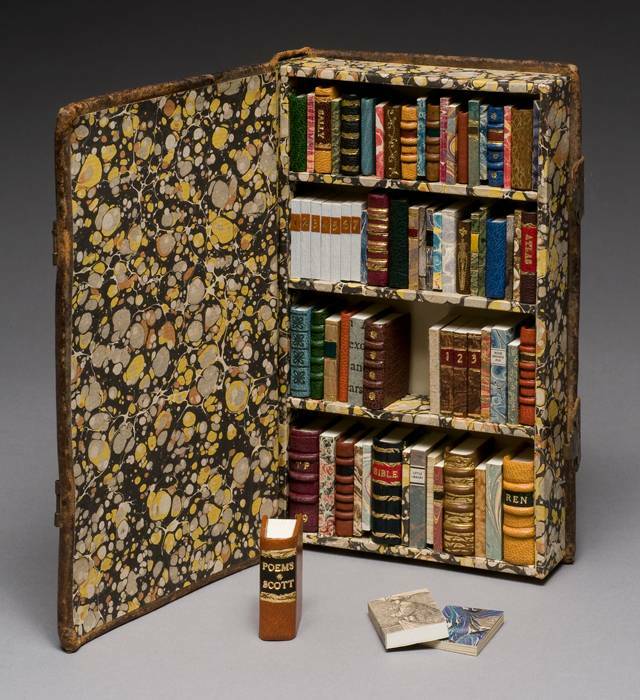 And it looks pretty amazing–both similar to and very different from Pattison’s orderly little library. 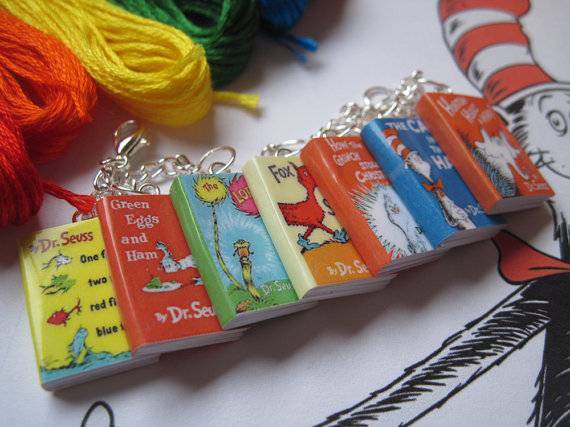 Dr. Seuss Book Bracelet, from Little Literature. Alternately, of course, we could all pitch in to buy a focused ion beam system and a scanning electron microscope then go to town on some silicon. Yes. Let’s do that. If you’ve walked through the library recently, you might have noticed that one of the displays is draped in caution tape–fear not! 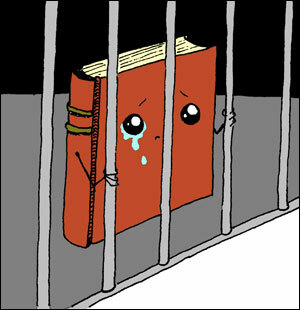 No violent act has occurred at the library–rather, we’re celebrating banned books week! From children’s books to YA and into adult material, some of your beloved favorites have been considered too vulgar to grace the shelves of some libraries, and have been protested all across the country. Luckily, because libraries represent a safe place for all information to be obtained freely, we DO have these books, and you can check them out, too! Did you know that Shel Silverstein’s book, A Light in the Attic, was considered unsuitable to keep in schools because it promoted violence and disrespect? How about the Wizard of Oz? Deemed useless because it promoted negativism and had no value, that story was also banned! Don’t forget to see what other priceless treasures we have available for checkout that you just might not be able to get in other places…stop in today! Did you know you have full access to the New York Times dating all the way back to 1851? Look under the list of General Databases on the library page, and be amazed! We hope you had a fabulous summer! Now, as you dive head first into classes, enjoy these beginning of semester reminders about library services! The library does its best to accommodate all learning styles by providing areas that allow for an average noise level, small noise level, and complete silence. If you are looking for a place to work in a group with your friends, the Reference area to the right of the library entrance is the place for you. If you need to work on a project in a small group, which involves a moderate level of conversation, head to the Reading Room down the hallway to the left of the cafe. For complete and total silence, head to the quiet study room, located on the second floor of the building or into the stacks where you will find study carrels and comfortable seating. If you would like to check out a group study room, you must at have at least two people using the space. Keep in mind that reserving the room in advance is your best bet, as rooms get reserved quickly and there is no guarantee that you’ll get one as a walk in. You can reserve rooms over the phone X8256, in person, or online. We’re so excited to have everyone back! It’s going to be a fantastic semester–thank you for making the Regina library part of your college experience.